Discussion in 'Edged Tools' started by tobiism, Nov 7, 2018. Boy I've wanted one of these for a long time. Finally took the plunge, picked up an '82 vintage and had the seller send it straight over to Ben at Baryonyx to raise the primary grind as I didn't feel like doing it LOL. Got to me today and I trimmed the wooden scales down flush with the tang and peened the copper rivets a little more to tighten the fit. Then I just sanded until smooth and oiled it with b l o. This knife was the inspiration for Ethan Becker to create the bk2. So I figured I'd picture it along with one. Anyone else rocking one? Post up your pictures! o'drab, MichaelBear, Markopolo and 69 others like this. That M.O.D. is the best one Ive ever seen, raising that grind was a great idea. woodsmanjohn, mtngunr, Bryan King and 9 others like this. Really cool knife and a neat history. Very clean grind too. woodsmanjohn, mtngunr, MrFixIt and 4 others like this. Thank you! She deserved a thoroughly usable edge! woodsmanjohn, MrFixIt, DavidJAFO and 3 others like this. woodsmanjohn, blind & lost, mtngunr and 6 others like this. Dang, that really reminds me of the original Hudson's Bay camp knives. central joe, woodsmanjohn, mtngunr and 6 others like this. I feel a bit inadequate, I've never seen one before. I don't know what the original grind looked like, but to me a high grind is a good grind. central joe, woodsmanjohn, mtngunr and 5 others like this. Kinda a scandi looking grind. central joe, mtngunr, MrFixIt and 3 others like this. central joe, mtngunr, MrFixIt and 2 others like this. I was once told that the handle scales not being flush with the tang was purposeful as it was meant to trap material from a glove as the knife was envisioned as being used in the Fulda Gap scenario fighting the USSR during the Cold War. central joe, mtngunr, ExAF1N1 and 5 others like this. I've read the British troops call them the "tree beater", a comment on the lack of edge...as issued. You will have no such problems. Brilliant, Sir, just genius. central joe, RobbieinME, mtngunr and 5 others like this. Bludgeoning someone to death is actually very effective... just ask knights. Got any custom sheath plans? central joe, Howie, mtngunr and 5 others like this. That grind is how that blade should be. Good work! Yes saw teeth would be fantastic! central joe, field-expedient, mtngunr and 4 others like this. Yes it does! Those rivets! central joe, mtngunr, Primordial and 3 others like this. 45jack, central joe, Redwalker and 4 others like this. @tobiism my original issue (spare) the humble MOD (Ministry of Defence) Survival Knife. I have never used this. I have always thought of literally modding such like so. The basic function of the MOD knife is to cut or chop, & if needs be self defence, to my knowledge the MOD knife has never been used in conflict in anger, or self defence to despatch anyone. I have seen this knife abused to the limits to pry open crates, open cans, seat locking pins, drive nails, or any other of a myriad of uses that generally defy its intended purpose. This knife will do anything you ask of a piece of steel of its size. It will withstand the punishment of cutting & batoning accompanied by a "doofer". This knife was made as a purpose built survival knife, for the worst possible conditions. *Doofer when you strike the baton off another item, in this case a blade to split the wood, as you do so you say, "Doof..Doof.." I picked this saying up during SERE training many years ago, as the training staff mentioned, a further essential piece of kit we should forage for is a "Doofer". Strange looks all around "WTF is a Doofer"? Once you see the funny side, you'll hear somewhere on the Survival course the sounds of "Doof..Doof" ringing aloud around the woods. o'drab, central joe, IAOutdoors and 17 others like this. Recently I was gifted this Wilkinson Sword ‘D’ type survival knife. These were issued to RAF aircrew back in the Cold War days and were the precursor to the MOD survival knife which I believe was cheaper to make. Next to it is what some people call a Jack knife or Pusser’s knife I think these were issued to the Royal Navy but with a Marlin Spike for undoing knots, so again this maybe British Army / RAF issue. The Victorinox is the current RAF issue aircrew (fast jet) survival knife, it’s a very good tool if a little small for some tasks. I think on bigger aircraft it’s paired with an Estwing Sportsman’s Axe which is a good combination. The D shape is a bit of a beast, it’s a good chopper and splitter but I think I prefer the pen knife and axe combo. central joe, cek, Derzis and 10 others like this. That is an awesome looking blade, the regrind looks great. central joe, pellegrino, mtngunr and 1 other person like this. Welcome to the BCUSA forum what you have there @Limaed is a piece of Cold War history. I've used the Wilkinson Sword ‘D’ type survival knife early 1980's. I was issued with 2 MOD knives (as per the thread), 1 of which has seen better days but still very much usable. I love my Jack Knife, these at one time were issued to ALL 3 Services (Navy, Army, Air Force). They're a very robust tool. I've seen the Victorinox Hunter (civilian) version, but since we're having a "shiny thing" & a BCUSA Swiss Army Knife forum, I might just add the Squipper's version to my wants list (speed dial Squipper's stores). central joe, pellegrino, mtngunr and 6 others like this. I love those knives. I had one for a bit and foolishly sold it off. central joe, Merk3030, mtngunr and 2 others like this. slightly O.T but.. I have also a spare issued Squippers tool (unused) made by Joseph Rogers of Sheffield since the 1960's, it had @Mr.Black name on it, sadly I'm unable to mail such State side. central joe, pellegrino, Merk3030 and 4 others like this. Didnt @Mr.Black use one of these for quite a while? central joe, DavidJAFO, mtngunr and 2 others like this. According to the folk at J. Adams, they have made them all, either under direct contract to the MOD, or subcontracted for others names, to include the Wilkinson Sword brand. The earlier appear drop forged with convex, while the later appear ground from a bar. I DO hope that was not an earlier one you modified. The knives were made to take anything, whether pounding nails, or digging a trench around shelter, and even the flat ground split wood with amazing ease, generally a few blows and the round or wedge simply falls in half. Actual cutting seemed hardly envisioned. But, for all the folk following the survival knife saga over the years, leading to the British colonial term of bushcraft, the UK forces were majorly into batoning, there were/are numerous survival schools run by former SAS types, and that stuff eventually transferred here. Sgt Major Lofty Wiseman, head NCO of the SAS, came over here to the US, to help us stand up our Delta Force, the skills translated into our forces, and our guys also became quite well known survival intructors. 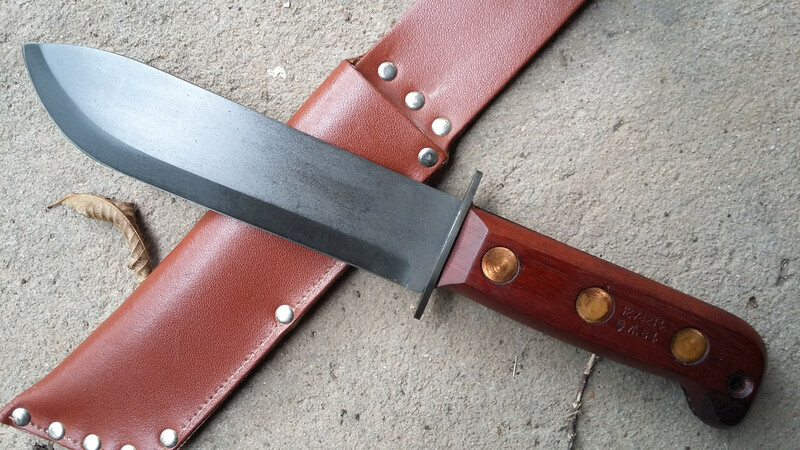 The MOD is arguably the first "bushcraft knife" to spread worldwide. Behold your roots, folks. I have an earlier J Adams marked knife all nicely rounded and convexed, which explodes wood apart with a few taps. I also have a later ground version all in black with the phenolic. The metal was recessed to not touch hand when knife extremely hot or cold, was what I was told. If you dig enough through old knife forum archives, you will find a series of posts by a guy working at J. Adams, talking of all the various named blades at the shop, and old Wilkinson Sword brand still on hand after contract changed, which led to a blizzard of requests from posters, and the guy saw he had unleashed something unexpected, and dropped offline. The information as to J. Adams also being the maker of the other brands was also confirmed by a higher ranking J. Adams employee who mailed me a replacement knife from the UK, for a defective one, and the original issue brown box with reinforced metal corners, and plastered with postage and customs stickers, was a welcome addition to an otherwise very humdrum knife. As for the steel, think Euro and metric equivs to 1/4" thick very pure 1095, held at mid 50s Rc max....you may bend one, but doubt anyone will break one. central joe, DavidJAFO, Limaed and 1 other person like this. note zero grind lines, nor is knife flat, it has a distal taper to tip, and blade deepens out front, again, possibly a rolling operation. Also, just above the primary "grind" the blade is thicker (perhaps pushed there by rollers), and then thinner towards back. The effect is to pop wood apart and no drag above primary. I would call this an intermediate version between the Wilkinson Sword versions, and the last versions ground from flat stock with more tanto-ish tips. Even the latter work quite well. BEWARE of many forgeries, called MOD knives...the actual article will have the broad arrow, date (of contract, and entirely possible to get a 2001 knife made yesterday, etc), maker (contractee, actually), and NATO number. The forgeries look identical, but do NOT work as the originals, not in hand, and not in wood, whether splitting or carving (with own self applied edge). ALSO, a common defect, at least on the later black handled knives, is a cracked guard braze line on one side. It seems either guard not fully seated, or handle scale slighly long on one side, but the scale pressure cracks the silver soldered guard on one side. It does not move, it does not rattle, is thoroughly trapped and going nowhere. BUT, the problem does exist enough I have seen three, personally. I HIGHLY recommend one of these circa $100 (maybe higher, now) knives, the black phenolic handle version, just your truly unbreakable emergency parkerized beater/pryer/basher in the auto, needing very little attention as it sits there ready to save tearing up something much nicer. central joe, DavidJAFO, A K Church and 4 others like this. I love my British MOD Survival Knife! It's marked 'JA 1988' (J. Adams?). There's a long number over the date, which I believe is a patent number? I've abused mine batoning dry, hard Oak, chopped small trees down and I've dug a few holes, including a SERE 'H' fire pit. It's available for whatever duty I require. I was told the oversize Scales (Cocobolo on mine) are for winter use. The extra wood helps keep the hand or glove from contacting the bare metal. Those that own a MOD Survival knife know the two (2) spot welds on the Cross-Guard add to the overall indestructability of the knife. My original sheath got wet in the back of my vehicle and sort of disintegrated, so I had a new one made out of Rain Deer with a Kydex liner. I like that 'high Grind! Sweet! I wonder if I can fid somebody local to do that? central joe, DavidJAFO, mtngunr and 1 other person like this. The number is the NATO stock number. Older knives marked on handles, newer knives stamped into blades, the maker, NATO number, date of contract (not manufacture as I maybe said automatically above), and the MOD acceptance "broad arrow" stamp. central joe, A K Church, DavidJAFO and 2 others like this. @mtngunr Thanks for the info. I've had mine for a good 25 years or more, the ID marks are on the handle along with the 'Broad Arrow'. In fact, it's sitting next to me as we speak. I took it out of the vehicle for a little PM and haven't put it back. On left Scale is stamped "Sheffield England", but as you stated above the actual manufacturer is J. Adams. Learned something new today. central joe, DavidJAFO and mtngunr like this. I’ve had one of these in my wish list on Amazon for a while now. Can I safely buy one or do I need to watch out for counterfeits? There is a black handled version too. Is that legit or not? central joe and DavidJAFO like this. It is no super knife, the latest crude tanto looking thing Tobism posted above is the current one, geared mainly to storage, taken to a flat 0° ragged edge and the entire thing parkerized against survival gear rust. And likely a higher quality purer 1095ish, but left at Jet Pilot hardness. Think of it as a giant JPK DIY knife. A very good splitter, large enough to trench with, or hammer nails...if sharpened, can do some woodwork, even. This is a very old and long 45min video. The guy is actually pretty entertaining, but, as for the knife, you can fast forward thru the video where he chops with a variety including his own knives, a genuine issue MOD, and one of the common WebTex or whatever fake MOD knives....he also splits rounds a bit later with each.....and then at very end, he does a bit more detailed with each. He is testing the latest version of the knife, fyi. Keep in mind, this is a knifemaker who applied his own edges..
central joe, DavidJAFO and XMP like this. I'm actually pretty fond of the steel in this thing. It grinds nicely. And will actually take a very fine Edge that's seems to be pretty durable so far. My earlier type D Wilkinson Sword branded knife that I had had the really well done convex and that was a sweet knife. I wish I hadn't sold it. central joe, DavidJAFO and tobiism like this. It is an excellent steel, Tobe.....just good old plain steel which seems to shock folks today, "eek! it rusts and dents!!! EPIC FAIL!! took a lot of work to slice paper!!''" In my chat with them, they were cagey as to the exact steel, only detail being it met all highest specifications, and my feeling being they just did not want to let on they were using Euro market Krupp or Bohler Uddeholm Vest/Vost/whateveralpine, which actually I would prefer. My two, older and newer are NEVER going away...my black one is my beater. The old one was used quite a bit before retiring, just a superb finish was applied, and stayed quite attractive looking. The newer cruder ground ones can be found same age and even earlier, and mine may have been last of older stock. But, the older are a lovelier knife in the steel work, for sure. And, "back in the day", many many folk were regrinding these knives, in all manner of ways, the best and most attractive were done just as yours. central joe, DavidJAFO, A K Church and 2 others like this. central joe, DavidJAFO, tobiism and 1 other person like this. Late 80s/early 90s, I had a sandbar conversation float tripping. Guy had one of the MOD knives on his belt (I had a Randall 5-6). His comments were much as you mention. Very tough, worked well as a knife or chopper. He disliked the sheath it came with, being a left handed set-up. It also did not, surprisingly, hold up well to brackish river water. 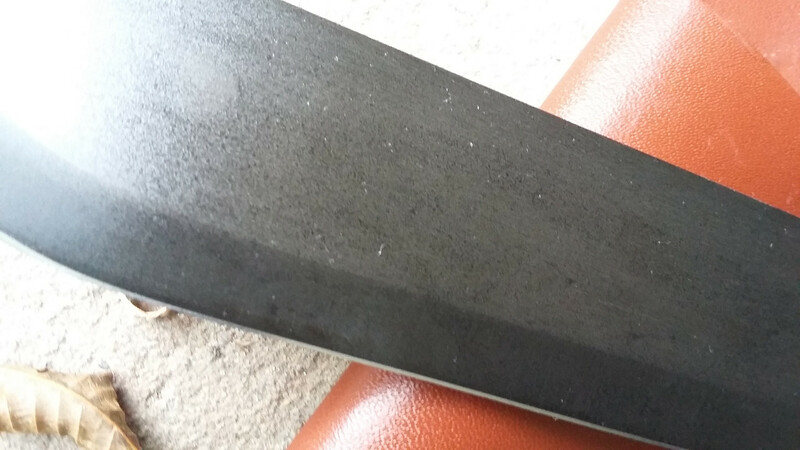 By the time I saw his, the knife had much wabi-sabi, and was in a Randall style sheath which he had wax dipped. I am not totally convinced the sheaths are even natural leather. The black ones look almost naugahyde woven inside, the older brown one like ugliest brown patent leather of 1968 while a totally white bleached nap on insides. Oh, and steel rusting rivets except the one at throat so you do not dull the crowbar. It is assumed the oversized retention straps are for wrapping handles according to some long forgotten SOP. 1st knife I bought with my 1st proper wage packet when I as 16! I still use it now. central joe, tobiism and DavidJAFO like this. I still have the original issue riveted leather sheath for the MOD knife. The sheath back in the 1980's was replaced with a British Army DPM sheath, made by SASS Ltd Lancaster England. I may now replace such with the present day MTP cam sheath. 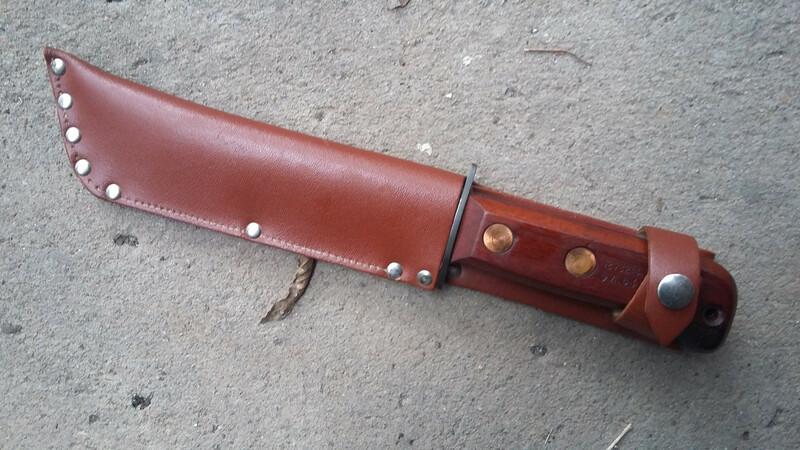 Mine came with the stamped rear leather sheath. It will have to be replaced with something a little more "special" as this doesn't cut the mustard. LOL. As said a Cold War souvenir. I haven't used it, & as for the UK knife laws mailing of knives, I couldn't even give it away boo hoo.. LOL but since I've read about customising the knife Scandi grind, it has got me thinking about future customizations. I was talking to someone (?) a while back via the BCUSA forum, as I did have my other MOD knife sheathed within a narrow green canvas studded pouch, stamped U.S which I was informed was either a rifle scope, or bi-pod carrier? it fitted nicely within, allowing the knife to be carried on the side of the Bergen. At the time the pouch was temporary camouflaged using adobe (water & clay mix), & a short length of webbing scrim, the U.S stamp taped over with canvas sniper tape. Bump.. M16 bipod pouch. the pouch I had was a customized version of this (see image). ALICE clips on rear, & 3 OG 1" inch belt straps machined horizontal down the front of the sheath as to affix scrim etc.. there were a set of stud popper fixings 3/4 of the way down the sheath, as to reduce its length to hold smaller items. why can't you ship it? @Corso Civil Aviation Authority world wide shipping R+R's won't accept such as it's classed as contraband. I've had it out with them face to face & they're not budging. I've tried many times, & had items returned with a very nice letter of warning with regards to contraband. ExAF1N1, central joe and DavidJAFO like this.